I’ve noticed recently that most people give up without even trying. They give up without even knowing that they are internalizing a “Chicken Spirit,” and dormant energy, instead of attracting high frequency of positive energy into their life. I have made the decision to live by FAITH and not by facts. I have learned that you have to give God a chance to show up and show out in your life and that in order to have faith for something, you must have something to offer The Creator to bless. Chickens can’t fly far. In fact, they can only fly short distances to escape predators. The threat that their enemy represents is the thing that motivates them to take flight. They can only fly for 13 seconds and the longest recorded distance is 300 ft. It’s in their DNA to only go so far. It’s a learned behavior that has been modeled by their parents and grandparents. 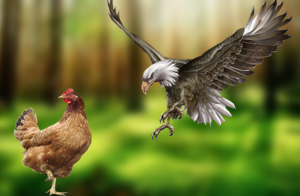 Having a Chicken Spirit is a curse that will cause you to lack the courage to pursue your blessings in life and will hinder you from leaving an inheritance to your children’s children. Your offspring will inherit your cowardice and YOU will be the cause for the passing on of that negative DNA/Spirit to their children’s children. You will be the cause of a generational curse that will last forever, unless someone in your family rises up to annihilate that spirit. Eagles, on the other hand, can soar, swoop, and twirl anytime they feel like it. They are the head and not the tail. Eagles create their own opportunities. Eagles run towards the storms that life brings, while all the other animals duck and hide (especially chickens). Eagles can see the silver lining from high above the darkest clouds. Before you make an excuse as to why you can’t do this or that, give yourself 1 REASON as to why you can! Just one, and place your faith in it. You don’t have 200 billion brain cells just because you’re cute or handsome. You can do whatever you place your Faith in and your Mind to. We’re teaching our youth to be Eagles through our chess program. Can I get an AMEN! Please, don’t forget to leave a comment and SHARE THIS! Thanks in advance & Have A BLESSED DAY! !